Keywords – Design for Emotion, Emotional Design, Emotional Intelligence, Emotional Granularity, Experience Design, Positive Emotions, Product Development, User Experience. Relevance to Design Practice – This paper details the value of differentiating between positive emotions in design practice. It outlines how design activities can be supported by a structured overview of positive emotion types in terms of meanings, eliciting conditions and influences on user behavior. Citation: Yoon, J., Pohlmeyer, A. E., & Desmet, P. M. A. (2016). When ‘feeling good’ is not good enough: Seven key opportunities for emotional granularity in product development. International Journal of Design, 10(3), 1-15. Received July 29, 2015; Accepted July 16, 2016; Published December 31, 2016. Copyright: © 2016 Yoon, Pohlmeyer, & Desmet. Copyright for this article is retained by the authors, with first publication rights granted to the International Journal of Design. All journal content, except where otherwise noted, is licensed under a Creative Commons Attribution-NonCommercial-NoDerivs 2.5 License. By virtue of their appearance in this open-access journal, articles are free to use, with proper attribution, in educational and other non-commercial settings. JungKyoon Yoon is a PhD candidate in the Department of Industrial Design at Delft University of Technology, and a lecturer at the University of Liverpool. His research focuses on experience design, mainly concerning how the differentiated nature of emotions can be leveraged in a design process. He previously worked as an interaction designer at Naver Corporation where he supported the development of an Internet search service, social media and product simulations. Dr.-Ing. Anna E. Pohlmeyer is assistant professor in the Department of Industrial Design at Delft University of Technology and co-director of the Delft Institute of Positive Design. With a background in psychology, engineering, and design, her research focuses on experience design, long-term UX and design-mediated subjective wellbeing. Prof. Dr. Pieter M. A. Desmet is Chair of the Design for Experience Research Group and Program Director of the Design for Interaction Master’s program at the Faculty of Industrial Design Engineering at Delft University of Technology. His main research interests are in the fields of design, emotion and subjective well-being. He is a board member of the International Design and Emotion Society and co-founder of the Delft Institute of Positive Design. The role of emotions in human-product interactions and the benefits of design that evokes positive emotions have been discussed extensively in the design research literature (e.g., Crilly, Moultrie, & Clarkson, 2004; Desmet & Hekkert, 2007). Understanding user emotions has been shown to be relevant to design for several reasons. They strongly influence usage behavior (Tractinsky, Katz, & Ikar, 2000) and the richness of usage experiences (Fokkinga & Desmet, 2012). In addition, emotions influence brand loyalty (Chitturi, 2009), product attachment (Mugge, Schoormans, & Schifferstein, 2005) and users’ subjective well-being in the long run (Desmet & Pohlmeyer, 2013). Inspired by these beneficial effects of emotions in user experience, designers have pursued emotion-focused design processes with the intention to design for positive user experiences. In practice, however, designers are confronted with various challenges throughout the design process in their efforts to deliberately evoke intended emotions (Goffin & Micheli, 2010; Yoon, Pohlmeyer, & Desmet, 2014b). An example is the challenge to ensure that all design team members have a shared understanding and expectations in respect of the intended emotional experience. Emotional design may not reach its full potential when these intentions remain unstated in the design process, which can result in unforeseen or even unwanted user behavior and experiences (see Jacobs, 1999, for an example). Hence, in emotion-focused design processes, it is beneficial to have the ability to specify and communicate the intended emotional impact of the design with clarity and precision. We postulate that one complicating factor in doing so is that designers are not equipped with an equally developed emotional granularity. Emotional granularity refers to the extent to which an individual can precisely and specifically interpret and articulate their own and other’s emotional states (Lindquist & Barrett, 2008). We propose that emotional granularity can be of use as a contextualized competence in a design process to support designers to clearly understand users’ emotions towards products and to envision particular emotions when conceptualizing designs. Several frameworks have been proposed to guide designers to design products that stimulate positive experiences. For example, Jordan (2000) introduced four sources of product pleasure based on psychological pleasure theory. Norman (2004) proposed three levels of pleasurable product experiences based on neurobiological emotion theory. Hassenzahl (Hassenzahl, 2010; Hassenzahl, Eckoldt, Diefenbach, Laschke, Lenz, & Kim, 2013) suggested six universal psychological needs as sources of positive product experience. These frameworks enhance designers’ understanding of emotional experiences by explaining how emotions arise in human-product interactions and how a design can affect users’ emotions. However, they do not contribute much to the designers’ emotional granularity because they mainly focus on general valance, experiences that are positive or pleasurable versus negative or unpleasant. In our view, helping designers to consider and communicate emotions in a more fine-grained manner can be beneficial because product emotions are more nuanced than what is captured with a general bipolar dimension of valance. Desmet (2012) showed that people can experience at least 25 different positive emotions in human-product interactions, ranging from pride, amusement and hope to love. Although these emotions are all pleasurable, they differ in terms of feelings, the conditions that evoke them and their influence on behavior and thoughts (Frijda, 2007; Lazarus, 1991; Scherer, 2005). For example, pleasant surprise pulls a person’s attention towards a product, leading to increased product recall and recognition (Ludden, Hekkert, & Schifferstein, 2008). A product that evokes inspiration infuses a user with new and creative thoughts, facilitating a shift in perspective (Desmet, 2008). A feeling of interest engages a user to actively explore product attributes and functionalities and prolongs the duration of use, resulting in an increased understanding of a product (Yoon, Desmet, & van der Helm, 2012). Given these differences, it can be advantageous for designers to be able to discern and articulate various types of emotions with specificity in their design activities, e.g., user research, design conceptualization and concept evaluation (Desmet & Schifferstein, 2012; Yoon, Pohlmeyer, & Desmet, 2014b). We can compare emotions to colors. Designers never end up deciding for a mere ‘bright’ color because although ‘apple green,’ ‘Tuscany cyan’ and ‘summer yellow’ are all examples of bright colors, each creates a very different product appearance. Likewise, aiming to design for ‘feeling good’ is not good enough when deliberately designing for emotions because there are many emotions that ‘feel good’ and not all of them are appropriate or desirable for every design, e.g., surprise instead of relaxation. This may sound obvious, but contrary to negative emotions, making distinctions between positive emotions can be more difficult than is often realized. Positive emotions are relatively less differentiated across the various components of the emotion process than negative emotions (Fredrickson & Cohn, 2008). For instance, interest, amusement and pride are not easily distinguishable from one another in terms of facial expressions as all result in a so-called “Duchenne smile,” i.e., raised lip corners accompanied by muscle contraction around the eyes (Campos, Shiota, Keltner, Gonzaga, & Goetz, 2013; Ekman, 2003). Similarly, some positive emotions come with less palpable thought-action tendencies. Thought-action tendency refers to the tendency that emotions spark both mind and body to act in certain ways, affecting the relationship between the individual and the object of their emotions (Fredrickson & Cohn, 2008). It is often easy to identify differences between negative emotions by observing behavioral manifestations, for example, of anger (the tendency to confront) and disgust (the tendency to reject). By contrast, most positive emotions are characterized by the tendency to approach and continue, the differences being subtle (Frijda, 2007), e.g., altruistic actions triggered by sympathy (Goetz, Keltner, & Simon-Thomas, 2010) and the act of perseverance stimulated by courage (Worline, Wrzesniewski, & Rafaeli, 2002). Besides, when people talk about their positive emotional experiences, the distinctions among positive emotions and other affective states like sensory pleasure and mood tend to blend (Smith, Tong, & Ellsworth, 2014). This implies that it is less natural for people to have positive emotional granularity by contrast to negative emotional granularity, distinguishing nuances of positive emotions requiring a more thorough understanding of the multi-faceted aspects of emotional experiences, such as feelings, behavioral manifestations and eliciting conditions. In design, a nuanced understanding of positive emotions is of particular importance because most design is intended to evoke positive emotions. The value of describing subjective responses with fine-grained distinctions has been widely demonstrated in the field of Kansai Engineering, which represents a body of methodologies that enable the quantification of relationships between design parameters and subjective experiences (Schütte, Eklund, Ishihara, & Nagamachi, 2008). Although similar to Kansei Engineering, the field of emotional design is more theory- than data-based, focusing on the psychological processes that underlie user emotions. Nonetheless, the value of considering nuances in experiential distinctions also applies to theory-based approaches to emotional design. This idea is supported by several studies that focused on distinct positive emotions in design, exploring the conditions that evoke them in human-product interactions. For example, Ludden et al. (2008) focused on pleasant surprise, Russo and Hekkert (2007) on love, Demir, Desmet, and Hekkert (2009) on satisfaction and joy, Yoon et al. (2012) on interest, Nicolás, Aurisicchio, and Desmet (2013) on confidence and anticipation, Desmet (2008) on inspiration and desire, Mugge et al. (2005) on product attachment, and Yu and Nam (2014) on humor. An understanding of the underlying eliciting conditions is advantageous when the design process starts with predefined target emotions. Desmet, Porcelijn, and Van Dijk (2007) report an example in their design of a mobile phone that evoked a ‘wow-experience’. They discovered that even though the various stakeholders involved in the project had agreed that the aim was to evoke a wow-experience, each had a very different idea about this experience. The researchers organized a session that used a set of fine-grained emotion terms to generate a shared understanding of the intended experience. The shared understanding turned out to be a combination of several positive emotions: fascination, pleasant surprise and desire. In this project, clarifying the emotional intention enabled a focused design process and the ability to measure the emotional impact of the generated designs. Positive Emotional Granularity (PEG) means “the tendency to represent experiences of positive emotion with precision and specificity” (Tugade, Fredrickson, & Feldman Barrett, 2004). Despite the potential value of PEG, to date scant attention has been paid in design research to this topic and its practical implications. We can propose the added value of PEG to design processes (e.g., clear explication of user emotions) from a theoretical point of view, but it is unknown if designers see its added value in their practice. For this reason, we undertook an interview study to obtain an overview of the expectations and needs of design professionals with respect to PEG. The research questions were: Do design professionals see benefits in having a nuanced understanding of positive emotions in design processes? And if so, what are these benefits and in what stage(s) of the design process will PEG be useful? Ideally, this study will result in insights that will help developing design (education) material that can offer PEG support in design practice. The second section of the paper reports the study. The first section provides a general introduction to emotional granularity, positioning it in the bigger context of emotional intelligence. The paper concludes with a discussion of the implications of the study and suggestions for future research. Emotional granularity is one component of the larger concept of emotional intelligence (EI). EI, which is also referred to as emotional competence, is the ability to appropriately understand and reflectively manage emotions in the self and others (Mayer & Salovey, 1997). It reflects the extent to which a person can process sophisticated information about emotions and emotion-related stimuli and their ability to use the information as a guide to thinking and behavior. Salovey, Detweiler-Bedell, B. T., Detweiler-Bedell, J. 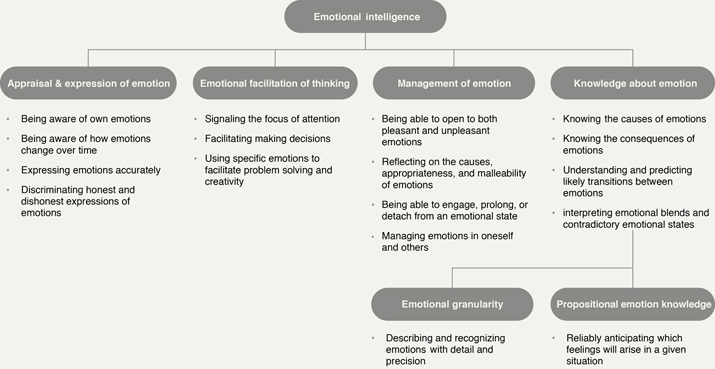 B., and Mayer (2008) describe the roles of EI based on its four different aspects: (1) the appraisal and expression of emotion, (2) emotional facilitation of thinking, (3) management of emotions and (4) knowledge about emotions (see Figure 1). (based on the works of Salovey et al., 2008, and Hay and Diehl, 2011). The first aspect of EI relates to individual differences in the ability to properly determine and express one’s emotions and to be sympathetic to the emotions of others. It also includes perceiving non-verbal signals and emotions represented in stimuli such as art (Mayer, Salovey, & Caruso, 2004). Some people are attentive to their feelings and can suitably express their emotions, whereas some people cannot adequately express or are unaware of their emotions (Zhou & George, 2003). This aspect is particularly advantageous in social contexts as the accurate expressive display of emotion ensures that people are able to effectively communicate with others (George, 2000). The second aspect concerns using emotions to aid cognitive processes. Emotions and cognition are highly interconnected and EI enables people to use emotions for the effective cognitive processing of information (Zhou & George, 2003). For example, emotions signal what should be the focus of attention (Frijda, 2007) and enable one to make decisions. The ability to predict how one would feel if a certain event occurs helps a decision-maker choose between multiple options (Baumeister, Vohs, DeWall, & Zhang, 2007; Damasio, 1999). Emotions also facilitate certain kinds of cognitive processes; positive emotions stimulate creative thinking and inductive reasoning, whereas negative emotions stimulate attention to details, detection of problems and careful information processing (Fredrickson, 2013; Isen, Daubman, & Nowicki, 1987). The third aspect of EI relates to managing the emotions of oneself and others. Research has found that people strive to maintain positive affective states and to alleviate negative affect (Mayer & Salovey, 1995). Some people are better than others at managing emotions to maintain a positive state for themselves and for others. For example, a person may feel anger when they find that the vacuum cleaner does not perform as expected. In this case, a person with high EI would not immediately show an outburst of anger. Instead, they would first analyze the source of their anger: Was it actually caused by the cleaner’s poor performance? Or was it the frustration about the cat that seems to take pride in shedding hair all over the place? Or was it actually attributed to their partner who had carelessly forgotten to recharge the battery? In the latter case, instead of peevishly accusing and blaming the partner, a person would express their own feelings in a non-confrontational way, checking the partners’ emotions at the same time; are they slightly worried or apologetic? The tone of voice and reaction would adopt the emotions of both of them, which would be likely to calm the feeling of anger. Essentially, emotion management requires the ability to reflect on what one has done in light of personal concerns or social norms, the current emotion and drawing conclusions about how an alternative behavior would create better emotional states (Baumeister et al., 2007; Zhou & George, 2003). The fourth aspect concerns the emotion knowledge that people use to understand and reason the causes of the emotions experienced by themselves or by others and how these blend to generate other emotions. ‘Knowing’ emotions constitutes several dimensions such as propositional emotion knowledge and emotional granularity. Propositional emotion knowledge is the degree to which a person can reliably anticipate and describe which feelings would arise in a hypothetical situation, e.g., how would you feel if the battery of your mobile phone runs out when you desperately need to make an urgent call? (Lindquist & Barrett, 2008). As was mentioned in the introduction, emotional granularity, also referred to as differentiation (Carstensen, Pasupathi, Mayr, & Nesselroade, 2000), reflects the ability to describe and recognize their own or others’ emotions with detail and precision (Lindquist & Barrett, 2008). Highly granular people describe the emotional experiences in discrete emotion terms to identify their distinctiveness. For example, in response to a given situation, an individual with high emotional granularity may report “feeling pride, with a hint of joy” whereas someone with less granularity would describe “feeling nice” or “happy”. Differentiating emotions enables a person to adequately convey one’s own or others emotional states, make inferences about them and make predictions about how to act (Barrett, Gross, Christensen, & Benvenuto, 2001). The four aspects of EI are conceptually distinct, but also closely associated with each other. Psychology literature reports that emotion knowledge is also related to the degree to which a person is aware of their emotional states in both the past and the present, i.e., the appraisal and expression of emotion (Barrett et al., 2001). EI also has a strong association with the management of emotions. Tugade et al. (2004) show that emotional granularity confers how well a person can understand and cope with unwanted situations and communicate effectively, thinking of an array of behavioral options that could lead them to positive emotional states. The previous section explained the concept of emotional granularity in relation to other aspects of emotional intelligence. This section reports an interview study conducted to explore the roles of PEG from the perspectives of design professionals. Yoon, Desmet, and Pohlmeyer (2013) showed that design students were convinced that a design process could benefit from PEG in various cross-functional communications such as inquiring about stakeholders’ concerns. The study presented here investigated the practitioners’ perspectives regarding the entire product development process by involving design professionals, both designers and professionals in other functions. The different roles of individuals within a product development team were taken into account. A model of the product development process was selected from the literature to position opportunities to apply PEG in relation to different product development phases. 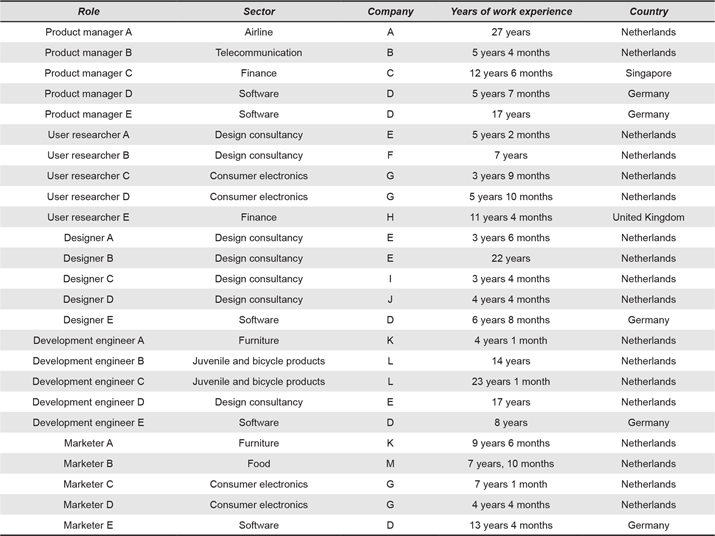 For the current study, five roles for team members in a product development process were selected based on those specified by ISO (2010) and Ulrich and Eppinger (1995): product manager, user researcher2, designer3, development engineer and marketer (see Table 1). Involving these different roles is relevant because (1) the main benefits of PEG might vary for each role and (2) at each stage of a product development process, various functions are involved and in most of the stages, design is integrated into several collaborative activities. For example, in the fuzzy-front end, designers collaborate with user researchers and marketers to identify user requirements (Visser, 2009) and designers cooperate with marketers and engineers in concurrent engineering (Roozenburg, 1995). Table 1. Different roles within a product development team. Figure 2. Product development model used in this study (adapted from Buijs, 2012; ISO, 2010). Product in use: The actual use of the product takes place. The company investigates user feedback and the responses from competitors, resulting in a change of the strategy. Strategy formulation: The earlier recognized needs are validated. Market opportunities and internal competency are analyzed, resulting in new product ideas. Design brief formulation: The needs of the potential end-users are investigated in detail. The ideas are transformed into concrete product ideas and described in the design brief. Development: The design brief is translated into design concepts and the concepts are tested. The product’s final design is engineered to be optimal for production. Market introduction: The product is launched, produced, distributed and sold. In the model of a product development process, conceptualization and embodiment take place in the development stage (Buijs, 2012; Roozenburg, 1995). In our reference model, we added a Human-Centered Design (HCD) process to ‘development’ to elaborate the design activities and related benefits of PEG based on ISO (2010). There are four main activities in HCD processes: (1) understanding and specifying the context of use, (2) specifying user requirements, (3) producing design solutions and (4) evaluating the design. The following section reports where PEG becomes advantageous, based on the phases of a product development cycle defined above. The recruitment of interviewees was based on the selected five roles. For each role, five practitioners were recruited, each with a minimum of three years of work experience (in total 25 participants). The participants were affiliated with 13 companies in four countries (Netherlands: 10, United Kingdom: 1, Singapore: 1 and Germany: 1). The companies were drawn from a wide range of business sectors including telecommunication, consumer electronics, software, finance service, food, furniture, airline service and design consultancy (e.g., Philips, Wacom, OCBC bank, PepsiCo and KLM Royal Dutch airlines). Involving people from varied backgrounds sought to gain a variety of perspectives. The main selection criterion was to have an equal distribution of the five roles. Participants were recruited from the authors’ professional networks and were not paid for their contribution. Table 2. Interviewees at the case companies. Semi-structured interviews were conducted individually, each consisting of three phases: sensitizing, interviewing and discussing. The aim of the sensitization phase was to stimulate the participants’ general awareness of the nuances of positive emotions. In advance of the interview, each participant was asked to think of product examples and provided with the definitions of three emotions: pride, confidence and fascination. Desmet (2012) shows that similarity between confidence and pride is the highest among 25 positive emotions while fascination is perceived very differently. Stimulating participants to think of the differences between two similar positive emotions and one dissimilar positive emotion sought to facilitate their awareness of the nuanced nature of positive emotions. In the beginning of the session, the participant presented three product examples through which they had experienced each of the given three emotions respectively. The concept of PEG was presented following the explanation of Lindquist and Barrett (2008): “people who are emotionally granular use emotion expressions such as love, relief, interest, and confidence to represent discrete qualities of certain experiences. Those lower in granularity use emotion expressions in a less precise way using global terms such as feeling nice or happy” (p. 516). To help the participant, Desmet’s (2012) visualization of a structured typology of 25 positive emotions was provided. An A3 sized sheet was provided with the product development model of Buijs (2012) and the key stages and entailed activities were explained. Next, the participant was invited to generate ideas about how and when high PEG might support the process of their own tasks and its possible benefits for other roles. The participant was instructed to write their ideas on the A3 sheet. There was no time limitation. After the idea generation, each participant discussed the ideas with the interviewer (first author). All sessions lasted about 1.5 hours and were audio recorded. All data collected during the sensitization exercise and the interview was combined. The process of data analysis was based on thematic analysis (Braun & Clarke, 2006), a qualitative analytic method for reporting patterns within data. Recorded audio data, ideas on sheets and the notes of the interviewer were transcribed and coded. The model of product development process and the five roles specified in the previous section (see Figure 2 and Table 1) were used to deductively set the codes of stages and roles, i.e., pre-set codes, while the codes of benefits and related design activities were inductively derived from the quotes and notes, i.e., emergent codes. “End-users”, “stakeholders” and “entire team” were added to the pre-set codes, these groups being frequently mentioned as possible beneficiaries of PEG during the interviews. This coding scheme was structured to provide an overview of when, for whom and for which activities high PEG could be beneficial. For example, one participating designer said: “In the development stage, the communication between team members can be more efficient in translating the intended emotions to product characters that can embody the values.” This response was considered to contain three meaning units and was assigned to three different codes. The first text segment ‘In the development stage’ fitted into the code “development”. The second text unit was “the communication between team members”—this text was considered to fit into the code “product development team”. The third text segment “communication between team members can be more efficient in translating the intended emotions” was considered to fit into the code “communicating the design intention in terms of emotional experience”. For each suggested idea, the related activities were clustered according to possible benefits. Then, the clusters were organized based on product development stages and roles. The generated clusters were named and paired with the suggestive quotes. We firstly report our observations during the sensitization exercises. Next, we describe the opportunities to work with PEG that were suggested by the participants. Then, additional observations from the interviews are reported with a focus on the participants’ opinions on the usefulness of PEG. The sample products that the participants chose for the sensitization exercise were diverse, including a sport utility vehicle, hiking boots, a fountain pen and mini-tents. Most participants reported that the exercise helped them to realize that there is more than mere pleasure to be considered in product development. The designers, user researchers and marketers tended to immediately grasp the concept of nuances of positive emotions and its relevance to product development, whereas the product managers and development engineers needed more elaborate explanations. Although these two groups exhibited their interest in the research topic, they were initially uncertain about their contribution to the study, ascribing this to their lack of knowledge about emotions. Across all five roles, the participants found the typology of positive emotions helpful in understanding the nuanced nature of positive emotions. They compared the emotions in the typology, some of them using the emotion terms in the typology to point out other positive emotions they had felt towards the sample products. In general, the participants mentioned that they enjoyed the exercise and that it made them more aware of the study topic. The benefits identified were categorized into seven main groups, each consisting of various advantages related to specific design stages and roles. Table 3 gives an overview of the main findings in the order of the product development process. Table 3. An overview of the suggested benefits of PEG in a product development process. In the following, we report and discuss the main groups and related opportunities, illustrating these with participant quotes. It makes me vigilant when observing people considering if the target positive emotion can be actually experienced (User researcher D). The emotions in our tool are a little bit random. It would be interesting to have a structured list of positive emotions, so when people see them, they can point out things and explain the meaning behind it (User researcher B). User researchers and designers responded that in observational research, having a developed PEG would enable them to carefully and precisely interpret end-users’ affective responses on the basis of expressive behaviors that end-users show in response to a given product or situation. User researchers found it helpful to develop a research tool that could be used for measuring user emotions by including a comprehensive set of positive emotions. It was mentioned that based on the results of measured emotions, they would be able to lay out the changes to user emotions in a series of instances in product use. The suggested implications were benchmarking the emotional impact of competing products in the stage of formulating a strategy, validating the emotional impact of a concept in the development stage and measuring end-users’ responses in the product use stage. We don’t want to just satisfy our customers. We want to deliver more than that such as a sheer awe or desire. For this, it is essential to be able to understand and represent the details of the customers’ emotional states (Marketer D). I am more interested in nuances of behavioral impact that positive emotions could spark because that’s more concrete than putting some emotion words. It already shows why we design for certain emotions. For example, when I designed a website of a museum, I aimed to make a user stay longer on webpages, thus he has more chance to get to know art-pieces of the museum. I did it by designing the interface to evoke fascination (Designer C). For the strategy formulation stage, marketers and designers found that knowing the current user emotions in response to an existing product on a detailed level would enable the identification of desirable positive emotions to be addressed; it could help them pinpoint the most critical areas to improve, to preserve, or alternatively, to give additional positive emotional impact. This, in turn, helps to specify which positive emotions to evoke in the design brief formulation stage. Differentiating positive emotions and being aware of associated behavioral effects were considered important when determining the emotional impact of a product; e.g., gentle behavior triggered by kindness and playful behavior triggered by amusement. They noted that as a secondary function in later stages, the specified positive emotions would serve to validate if the product could evoke the predefined ones or facilitate the intended behavioral effects when evaluating a design concept or prototypes. Clients or managers usually tend to consider emotion-driven approach as peripheral to the success of a new product and care more about the result that it will financially produce, rather than the approach that generates the success (Marketer C). Designers and user researchers talked about the need to demonstrate the added value of the emotion-driven design approach to draw enough organizational support from other roles in pursuing the approach. They suggested that it might be helpful to show why a certain product is preferred over a different one by revealing the end-users’ different responses with fine-grained emotion terms, and, if possible, their consequential business impact. The participants assumed that with this approach, others involved in the design process could also gain a deep understanding of how end-users feel about a certain product or situation and realize how important it is to consider emotions in product development. An external agency prepares a creative work for us such as a packaging design, but when we test it, consumers’ answers are often far from our expectation. But, the agency always says, ‘We did it as you asked’ (Marketer B). I often see development engineers ignore the design suggestions and go totally different direction. ... Perhaps, it’s because the current design brief is not effective … they don’t get what it feels like to be in the shoes of our users (User researcher E). When the design process evolves from design brief formulation to development, the determined target emotions need to keep their salience, not losing granularity until they are conveyed to designers or engineers. However, in practice, it was found that the information goes through several interpretations from person to person before it reaches the designers or engineers. People also often have different understandings of the same emotion, so the interpretation of the design goal can differ considerably from person to person. All five roles agreed that having developed PEG would help the entire team gain a shared understanding of the meaning of various positive emotions that they use in communication and in having shared expectations about the intended emotional outcome. If you design a chair, kindness, sympathy, respect… these could be starting points. You take one of these as a design theme, and later you can try other emotions too” (Designer A). Each emotion requires a different design approach and because of this difference, the sooner you realize what is right strategy, the better you can translate the emotion into the design” (Designer B). Designers valued PEG for stimulating divergent thinking, especially in the conceptualization phase. Having a high level of PEG could help envision various of the positive emotional responses of end-users and in thinking about how a product could lead end-users to experience intended positive emotions. Participants particularly acknowledged the given typology of positive emotions as a source of inspiration, assuming that it would guide them to a wide diversity of design directions. Since each emotion involves different eliciting conditions, they pointed out that the ability to distinguish the unique patterns of eliciting conditions could be useful in translating the intended emotions into design elements such as qualities of interaction and physical form. Some designers noted that it might be helpful to have an overview of the eliciting conditions as a reference, for example, emotion-specific appraisal patterns.. The story of user experience should stay consistent in terms of feelings. … I guess that design brief can be already used by both designers and marketers, not spending extra time for making a marketing plan from scratch (Marketer E). Marketers and designers suggested that it is important to coherently communicate to end-users, through eliciting consistent emotions with both product design and marketing communications such as advertisements, distinguishing nuances of positive emotions being essential to do so. They mentioned that a developed PEG would help them to explicitly share the idea of the intended emotions across the functions. Thus, in the market introduction stage, marketers can stress the identical emotional experience when producing marketing materials, ensuring that the emotions facilitated by marketing communications do not deviate from the emotions that are experienced during the actual product use. In later stages, people usually do not feel inspiration and curiosity. They just pay attention to fulfilling pre-defined requirements. They still can be creative and the process has to facilitate this. They should feel pride because of their creative contribution. If I don’t know the differences between these positive emotions, I don’t know what to facilitate (Product manager A). Besides the benefits that directly influence activities in product development, participants also mentioned some implications of PEG for emotion regulation. Product managers found it useful to be aware of nuances of positive emotions to foster appropriate positive emotions within a product development team by reflecting each stage’s main activities. Product managers emphasized that it is important to create a sense of team pride. For this, it is essential to understand the emotional states of the team and to facilitate appropriate positive emotions because team pride helps motivate and unify everyone associated with a project. A manager is involved in and manages the entire process. Because these emotions are a vision of a future product, they guide the process. It should be clear where the team is heading in the process. If the manager doesn’t understand what we want to elicit, then he feels very insecure and judge the approach and the ideas in it as well (User researcher B). Designers, user researchers and marketers noted that a design tool or a technique would be necessary to support the suggested opportunities that require a cross-function collaboration and that the development of such a tool should reflect the different concerns and terminologies of the various roles. They suggested that an increased level of PEG would allow the whole product development team to be frontloaded with specific positive emotions and associated user needs early in the product development process. The concerted effort leveraged by PEG could significantly contribute to the design of products in the end. There were also some less positive responses from the participants. Product managers and development engineers identified fewer PEG benefits than those in other roles and showed less enthusiasm for its advantages regarding their tasks. Some product managers were prone to downplay user emotions as a success factor in a product compared to other issues such as product price and project budget. They reported that the emotion-driven design approach was unfamiliar to their daily practices. One product manager mentioned that although he acknowledged the value of being equipped with a high level of PEG, decisions related to emotional experience were not within the scope of his work, being an exclusive domain of designers’ intuition and their authority. Development engineers often mentioned that they were mainly responsible for the realization and optimization of a product, seeing little practical benefits in PEG. One software engineer responded, “I mainly think about how to write code that is effective and reliable. My job is often explicitly defined. I just get informed or receive advice from the marketing department” (Development engineer E). Development engineers noted that they already consider emotions in their work, but they often do so implicitly rather than explicitly. Besides, issues related to product emotion were usually about eliminating negative experiences to ensure safety and quality of products. Another development engineer reported that despite the value of discussing the emotional impact of a product in conjunction with other roles, he considered it burdensome to talk about emotions: “I studied mechanical engineering that mostly deals with technical information. Communication of this subjective experience takes a totally different skill.” (Development engineer A). This study explored how and when people involved in product development can benefit from PEG. Results revealed seven main opportunities in which beneficial effects of PEG in relation to specific activities and roles can be expected across all stages of a product development process. The ability to precisely recognize others’ emotions facilitates (1) a deep understanding of users. Having a structured overview of positive emotions supports (2) designers’ precise determination of design intentions, which can increase the chance that a design will have the appropriate emotional impact. Furthermore, considering a broad array of users’ emotional responses can (3) stimulate creativity in the design process. Additional opportunities include (4) maintaining the continuity of a design’s emotional impact across product development communications and (5) increasing organizational support by being able to demonstrate the added value of an emotion-focused design process as well as (6) strengthening emotional coherence in communications targeting end-users. From an organizational perspective, PEG can also be beneficial when (7) managing emotions within a product development team. In general, the benefits of PEG were mainly associated with activities in design conceptualization and evaluation, appearing to be less relevant in the embodiment phase. The study showed that designers were in need of a holistic understanding of positive emotional experiences beyond provision of a set of fine-grained emotion words. They stressed the need to be able to compare positive emotions from a multi-componential perspective. For designers, PEG was seen as helpful when they envision the desired usage behaviors incited by various positive emotions as it allows them to reason and justify what kinds of positive emotions would be appropriate to address. Understanding the underlying eliciting conditions such as appraisals was considered valuable; designers can purposefully satisfy or violate certain conditions by manipulating product properties as determinants of specific emotions. Having a repertoire of positive emotions could stimulate lateral thinking as designing for multiple positive emotions can guide designers to look beyond obvious design directions, resulting in new alternative solutions. It was reported that PEG would be crucial for user researchers as it would enable them to immerse themselves in the users’ experiences by looking closely at users’ emotional states. This, in turn, could help them identify which positive emotions need to be addressed in design to build a shared understanding of the emotional intentions within the product development team. During the interviews, product managers and development engineers rarely reported the advantages of PEG in relation to their work processes. Although the participants in these two roles generated some ideas, most were associated with activities in other roles or with benefits for an entire team. Some participants even reported that PEG is not relevant to them because considering user emotions is not part of their responsibilities (e.g., allocating project resources and assessing production feasibility). Nonetheless, the other team members considered high PEG of product managers and development engineers crucial in order to pursue an emotion-focused design process. Designers, user researchers and marketers suggested that it could ensure the active involvement of these two roles’ in product development throughout the entire process, which can contribute to the management of the design process and key design decisions such as determination and communication of emotional intentions. Goffin and Micheli’s (2010) study showed that in the context of communication on design, managers tend to perceive differences in emotion words as irrelevant and hardly use the term ‘emotion’ while designers consider them crucial in conveying the significance of a design, frequently referring to emotion words. Perhaps because managers and development engineers rarely use words linked to emotion in their daily practice and are relatively unfamiliar with an emotion-driven approach compared to their colleagues, during the interviews they could not spontaneously see the value of PEG in their roles. Alternative research methods or more sophisticated sensitization processes could be used in future studies to further explore potential PEG benefits for these two roles. This paper focused on positive emotions considering that products are generally designed to evoke positive emotions. Negative emotional granularity might be equally advantageous in design. During the interviews, designers and user researchers stressed that distinguishing nuances among negative emotions is also important to getting insights into users’ demands and desires. Moreover, design sometimes deliberately targets negative experiences (Fokkinga & Desmet, 2012). For instance, a feeling of rejection could stimulate artistic creativity (Akinola & Mendes, 2008) and sadness makes people less judgmental of other people’s behavior (Schnall, Haidt, Clore, & Jordan, 2008). We should note that other qualities are equally important for emotion-focused design; having PEG is not a guarantee for success. Because emotions are essentially subjective, emotion-focused design requires user-centered and/or participatory design techniques to ensure a proper understanding of the experiences of the intended users and related contextual factors. The sample size was relatively small. Involving only five participants for each role might not be sufficient to fully reveal the relevance of PEG. However, in the analysis process, we noticed that after coding the data collected from half of the participants, the findings were already saturated. In other words, no additional opportunities were identified when coding the second half of the data set. From this, we assume that interviewing more people would not result in noticeably more insights. Another limitation was that the study only focused on design activities taking place in a company. Dorst (2009) emphasizes that design activities also happen across projects and companies, e.g., building an environment that stimulates collective creativity and a company culture that fosters commitment from stakeholders. In future work, broadening the scope of the design activities would be useful to better understand the relevance of PEG. We are aware there may have been an acquiescence bias in which participants generally tend to avoid negative answers. Since the researcher (first author) presented the aim of the study and moderated the interviews himself, the participants would be inclined to come up with useful applications of PEG out of politeness and hardly report when PEG would become less relevant or even impede their work. Each of the seven identified opportunities is worthy of investigating as they involve different aspects of emotion and the resulting insights can support designers in each opportunity. For example, the need to assess user emotions has already led to the development of refined assessment tools such as PrEmo (Desmet, 2003) that measure user emotions. These tools go beyond the distinction of positive-negative emotions and provide users with a repertoire of emotions to choose from. People begin to have granular categorization of emotions when they are exposed to a wider range of emotions, are taught a rich set of emotion vocabularies and learn to represent the experiences with greater detail (Lindquist & Barrett, 2008). Likewise, the ability to precisely identify expressions develops when mirroring those who are emotionally granular and who use emotion words in a correct way to depict emotional states. Because this implies that emotional granularity can be enhanced, we propose that designers’ emotional granularity can be supported with design tools that can help them in taking advantage of the identified opportunities. As argued by Lindquist and Barrett, how people use and think about emotion words does not aptly map the detail in what people know about emotions. An individual’s understanding of emotions becomes granular when there is an explicit association between feelings, situational contexts and emotion words. Reminiscing about emotional memories is also known to be useful to learn the concepts of particular emotions; discussing the feelings that were evoked in the given situation, the consequences of expressing the emotion, or how he/she coped with or sustained the emotions can lead to a nuanced understanding of emotions (Fivush, Berlin, Sales, Mennuti-Washburn, & Cassidy, 2003). In developing design supports, these factors should be taken into account. Regarding the opportunity ‘evoking specific emotions’, knowledge of the differentiated eliciting conditions needs to be increased to help designers understand the determinants of emotions. Several studies on eliciting conditions have been recently published. Tong (2014) investigated appraisals of 13 positive emotions and Campos et al. (2013) compared core-relational themes of eight positive emotions. In design research, a possible research direction could be to investigate if the general insights into eliciting conditions are applicable in human-product interactions. Resulting insights can support designers to deliberately elicit intended positive emotions. Concerning the opportunity ‘determining emotional intentions’, the findings from the study presented in this paper indicate that emotion can not only be a design goal itself, but also be used as a means to stimulate specific usage behavior as positive emotions involve distinct and specific behavioral effects (Fredrickson, 2013). To support designers to trigger the desired usage behavior by means of specific positive emotions, an understanding of what kinds of specific effects different positive emotions have on human-product interactions has to be developed. Recent research has shown that positive emotions cannot only be observed in the face, but also in other expressions such as posture, voice tone, touch and gaze (Sauter, McDonald, Gangi, & Messinger, 2014). App, McIntosh, Reed and Hertenstein (2011) argue that these different channels are related to the functions of emotions; the full-body expression is of relevance for emotions associated with social status such as pride and admiration while touch is used for intimate emotions such as love and sympathy. Advancing an understanding of behavioral manifestations of positive emotions can support designers to grasp users’ affective states and predict likely actions. During the interviews, most participants mentioned that they were surprised by the usefulness of having knowledge of emotions and wanted to have tools that could support them in this. For example, this could be a tool that facilitates design creativity for a designer and a tool to measure emotions for a user researcher. The seven identified opportunities could serve as a starting point for developing such design tools. There would be no single tool that could serve all of the seven key opportunities and 16 advantages because they address different needs and expectations of design professionals for PEG and each of them is relevant for different roles. This, however, does not mean that 16 different tools need to be separately developed. Perhaps a design tool and tool techniques could be developed in accordance with several opportunities. By tool technique, we refer to the way in which a tool is employed (Sanders & Stappers, 2012). For example, a card set that incorporates emotion terms and representative pictures of emotion expressions could be used for multiple purposes. Such a set could provide user researchers with a quick overview of positive emotions when they specify design intentions. Randomly chosen cards could inspire designers to consider non-obvious positive emotions when they generate product ideas or could help marketers as a reference when they explain the desired emotional experiences to others. Provision of multiple entry points to compare positive emotions seems to be crucial. The opportunity ‘determining emotional impact of a product’ showed that the participants wanted to browse through and compare the similarity between positive emotions based on several criteria in order to be more deliberate when specifying emotional intentions. Depending on the criterion, the similarity between positive emotions would be differently arranged (e.g., similarity based on effects on behavior, interpersonal versus non-interpersonal emotions, feelings and eliciting conditions). This would support informed design decisions based on a systematic understanding of the multi-faceted aspects of positive emotions. The level of granularity should adapt to the situation in which the tool is applied. The current study uncovered various situations in which designers can benefit from a fine-grained classification of positive emotions, but there might be some situations where a moderate level of granularity is more useful. Some designers and user researchers mentioned that when they report to a client about a general design direction, they would not want to have to go through all of the 25 positive emotions. They found the nine categories in the set sufficient for effective communication. Given the effectiveness of the sensitization exercise in the study, we postulate that concrete examples that depict certain positive emotional experiences in human-product interactions could help designers in getting a grip on nuances between positive emotions. In human-product interactions, positive emotions can be elicited by multiple sources (Desmet, 2012): the material qualities of the product, the associated meanings of the product, the interactive qualities when using the product, the activity facilitated by the product, the effects of using or owning the product and the effects of other people’s activities on us in which the product plays some role. These different sources can be demonstrated with the collection of examples. This would stimulate designers to explore various design opportunities for facilitating the intended emotions. Our research aims to understand how designers can be assisted in purposefully creating positive experiences that go beyond general pleasure. Given the fact that there are multifarious positive emotions that can be experienced in human-product interactions, we believe that the first step to design for such nuanced experiences is to understand these nuances. The next steps are to explore strategies to facilitate PEG and to develop tools that can be used in the design process because in general, natural language is limiting to express subtle emotional experiences. Applications of the resulting tools in design cases or an experimental study that could demonstrate the effects of PEG would help further validate the benefits of PEG in design. The 16 advantages identified from the interview study could serve as the starting point for the validation. This paper sheds light on the roles of PEG among various EI aspects. However, benefits of the other aspects, such as appraisal and expression, emotional facilitation of thinking and the management of emotions are no less relevant to design. We presume that all aspects of EI can be valuable, not only for the design activities within a product development cycle, but also for the activities that take place beyond the scope of product development. As found in the study, the management of emotions can contribute to cultivating productive working relationships. This is in line with Mayer and Salovey’s (1997) suggestion that those with high EI might be adept at managing projects that involve products with emotions and aesthetics and that this could affect the quality of the design outcome. Agarwal (2010) notes that a high degree of EI is critical for creating an emotionally safe environment for designers to freely express their ideas and emotions, making persuasive argumentation regarding emotional aspects of a product and fostering commitment from the stakeholders. However, there has been no empirical study regarding what types of emotional intelligence can contribute to these achievements in design activities. Future research is needed to address this. This paper offers new insights into how PEG can be of relevance in product development processes. The study findings show that PEG can serve several design activities across all product design stages. The main contribution is the overview of opportunities as identified by design practitioners. The results support the proposition that it is valuable to have a nuanced understanding of positive emotions and that emotional granularity in product development processes can ultimately provide end-users with better, more fitting, positive experiences. We would like to thank the reviewers for their constructive criticism of the earlier versions of this manuscript. We also express our gratitude to all participants for their contribution to the study. This research was supported by MAGW VIDI grant number 452-10-011 of The Netherlands Organization for Scientific Research (N.W.O.) awarded to P.M.A. Desmet. 1. 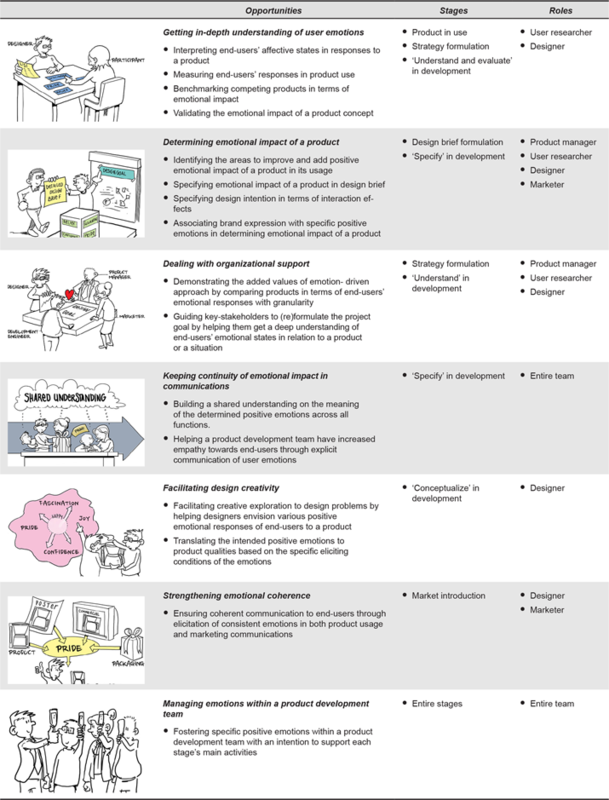 This section is a reworked version of “Nuances of Emotions in Product Development: Seven Key Opportunities Identified by Design Professionals” (Yoon, Pohlmeyer, & Desmet, 2014a). 2. Although it is commonly suggested in the literature that designers conduct user research having contacts with users (Leonard & Rayport, 1997), in practice, the person who performs the user research and the person who manages the design is usually not the same person. The research is often conducted by a third party (e.g., an external consultancy) (Visser, 2009). For this reason, we regarded user researcher and designer as distinct roles in this study. Depending on the circumstances of the project (e.g., size of the company and project budget), the distinction between the two roles could be either clear or blended. Besides, the identified roles might have different names in different organizations, but their primary roles are the same (c.f., Saffer, 2009). 3. Since the aim of this study was to explore the potential benefits of PEG in product development processes, we use the term ‘designer’ for the consistency and clarity in the paper instead of referring to the self-identified positions by the participating designers (e.g., industrial designer, usability expert, and interaction designer). The same applies to the other roles. 4. For the sake of clarity in mapping the advantages of PEG with each stage, we show the stages from ‘product in use’, but there is neither a beginning nor an end in this circular model (Buijs, 2003); launching a new product on the market and the successful use of the product will lead to competitors’ reactions (e.g., introducing better performing or more affordable products). This will cause the original company to start the development process of the next generation product line to regain its competitiveness. Agarwal, D. (2010). Team emotional intelligence in design thinking process. In S. Malekar (Eds. ), Emotional intelligence and leadership (pp. 39-46). Excel books. Akinola, M., & Mendes, W. B. (2008). The dark side of creativity: Biological vulnerability and negative emotions lead to greater artistic creativity. Personality and Social Psychology Bulletin, 34(12), 1677-1686. App, B., McIntosh, D. N., Reed, C. L., & Hertenstein, M. J. (2011). Nonverbal channel use in communication of emotion: How may depend on why. Emotion, 11(3), 603-617. Barrett, L. F., Gross, J., Christensen, T. C., & Benvenuto, M. (2001). Knowing what you’re feeling and knowing what to do about it: Mapping the relation between emotion differentiation and emotion regulation. Cognition & Emotion, 15(6), 713-724. Baumeister, R. F., Vohs, K. D., DeWall, C. N., & Zhang, L. (2007). How emotion shapes behavior: Feedback, anticipation, and reflection, rather than direct causation. Personality and Social Psychology Review, 11(2), 167-203. Buijs, J. (2003). Modeling product innovation processes, from linear logic to circular chaos. Creativity and Innovation Management, 12(2), 76-93. Buijs, J. (2012). The Delft innovation method: A design thinker’s guide to innovation. Amsterdam, the Netherlands: Eleven International Publishing. Campos, B., Shiota, M. N., Keltner, D., Gonzaga, G. C., & Goetz, J. L. (2013). What is shared, what is different? Core relational themes and expressive displays of eight positive emotions. Cognition & Emotion, 27(1), 37-52. Chitturi, R. (2009). Emotions by design: A consumer perspective. International Journal of Design, 3(2), 7-17. Crilly, N., Moultrie, J., & Clarkson, P. J. (2004). Seeing things: Consumer response to the visual domain in product design. Design Studies, 25(6), 547-577. Damasio, A. (1999). The feeling of what happens: Body and emotion in the making of consciousness. London, UK: Harcourt Brace & Company. Demir, E., Desmet, P. M. A., & Hekkert, P. (2009). Appraisal patterns of emotions in human-product interaction. International Journal of Design, 3(2), 41-51. Desmet, P. M. A. (2003). Measuring emotions. In K. C. J. Overbeeke, A. F. Monk, & P. C. Wright (Eds. ), Funology: From usability to enjoyment (pp. 111-123). Berlin, Germany: Springer. Desmet, P. M. A. (2008). Inspire & desire. In P. M. A. Desmet, J. van Erp, & M. Karlsson (Eds. ), Design & emotion moves (pp. 108-124). Cambridge, UK: Cambridge Scholars Publishing. Desmet, P. M. A. (2012). Faces of product pleasure: 25 positive emotions in human-product interactions. International Journal of Design, 6(2), 1-29. Desmet, P. M. A., & Pohlmeyer, A. E. (2013). Positive design: An introduction to design for subjective well-being. International Journal of Design, 7(3), 1-15. Desmet, P. M. A., & Schifferstein, H. (2012). Emotion research as input for product design. In J. H. Beckley, K. Lopetcharat, & D. Paredes (Eds. ), Product innovation toolbox (pp. 149-175). Hoboken, NJ: John Wiley & Sons. Desmet, P. M. A., Porcelijn, R., & Van Dijk, M. B. (2007). Emotional design; Application of a research-based design approach. Knowledge, Technology & Policy, 20(3), 141-155. Dorst, K. (2009). Layers of design: Understanding design practice. In Proceedings of the International Association of Sciences of Design Research (pp. 157–166). Seoul, Korea: Korean Society of Design Science. Ekman, P. (2003). Sixteen enjoyable emotions. Emotion Researcher, 18(2), 6-7. Fivush, R., Berlin, L. J., Sales, J. M., Mennuti-Washburn, J., & Cassidy, J. (2003). Functions of parent–child reminiscing about emotionally negative events. Memory, 11(2), 179-192. Fokkinga, S., & Desmet, P. M. A. (2012). Darker shades of joy: The role of negative emotion in rich product experiences. Design Issues, 28(4), 42-56. Fredrickson, B. L., & Cohn, M. A. (2008). Positive emotions. In M. Lewis, J. M. Haviland-Jones, & L. F. Barrett (Eds. ), Handbook of emotions (3rd ed., pp. 777-798). New York, NY: Guilford Press. Frijda, N. H. (2007). The laws of emotion. London, UK: Lawrence Erlbaum Associates. Goffin, K., & Micheli, P. (2010). Maximizing the value of industrial design in new product development. Research-Technology Management, 53(5), 29-37. Hassenzahl, M., Eckoldt, K., Diefenbach, S., Laschke, M., Lenz, E., & Kim, J. (2013). Designing moments of meaning and pleasure. Experience design and happiness. International Journal of Design, 7(3), 21-31. Hay, E. L., & Diehl, M. (2011). Emotion complexity and emotion regulation across adulthood. European Journal of Ageing, 8(3), 157-168. Isen, A. M., Daubman, K. A., & Nowicki, G. P. (1987). Positive affect facilitates creative problem solving. Journal of Personality and Social Psychology, 52(6), 1122-1131. ISO. (2010). 9241-210- Ergonomics of human-system interaction - part 210: Human-centred design for interactive systems. Geneva, Switzerland,: International Organization for Standardization. Jacobs, J. J. (1999). How to teach, design, produce and sell product-related emotions. In C. J. Overbeeke & P. P. M. Hekkert (Eds. ), Proceedings of the 1st International Conference on Design and Emotion (pp. 9-14). Delft, the Netherlands: Delft University of Technology. Jordan, P. W. (2000). Designing pleasurable products: An introduction to the new human factors. London, UK: Taylor and Francis. Leonard, D., & Rayport, J. F. (1997). Spark innovation through empathic design. Harvard Business Review, 75(6), 102-115. Lindquist, K. A., & Barrett, L. F. (2008). Emotional complexity. In L. F. Barrett, M. Lewis, & J. M. Haviland-Jones (Eds. ), Handbook of emotions (3rd ed., pp. 513-530). New York, NY: Guilford Press. Ludden, G. D. S., Hekkert, P., & Schifferstein, H. N. J. (2008). Surprise as a design strategy. Design Issues, 24(2), 28-38. Mayer, J. D., & Salovey, P. (1997). What is emotional intelligence? In P. Salovey & D. J. Sluyter (Eds. ), Emotional development and emotional intelligence: Educational implications (pp. 3-34). New York, NY: Harper Collins. Mugge, R., Schoormans, J. P. L., & Schifferstein, H. N. J. (2005). Design strategies to postpone consumer’ product replacement: The value of a strong person-product relationship. The Design Journal, 8(2), 38-48. Nicolás, J. C. O., Aurisicchio, M., & Desmet, P. M. A. (2013). Designing for anticipation, confidence, and inspiration. Proceedings of the 6th International Conference on Designing Pleasurable Products and Interfaces (pp. 31-40). Newcastle-upon-Tyne, UK: University of Northumbria at Newcastle. Norman, D. A. (2004). Emotional design: Why we love (or hate) everyday things. New York, NY: Basic Books. Roozenburg, N. (1995). Prescriptive models of the design process. In N. Roozenburg & J. Eekels (Eds. ), Product design: Fundamentals and methods (pp. 94-114). Hoboken, NJ: John Wiley & Sons. Russo, B., & Hekkert, P. (2007). On the conceptualization of the experience of love: The underlying principles. In Proceedings of the Conference on Designing Pleasurable Products and Interfaces (pp. 22–25). New York, NY: ACM Press. Saffer, D. (2009). Designing for interaction: Creating innovative applications and devices. San Francisco, CA: New Riders. Salovey, P., Detweiler-Bedell, B. T., Detweiler-Bedell, J. B., & Mayer, J. D. (2008). Emotional intelligence. In L. F. Barrett, M. Lewis, & J. M. Haviland-Jones (Eds. ), Handbook of emotions (3rd ed., pp. 533-547). New York, NY: The Guilford Press. Sanders, L., & Stappers, P. J. (2012). Convivial design toolbox. Amsterdam, the Netherlands: Bis. Sauter, D. A., McDonald, N. M., Gangi, D. N., & Messinger, D. S. (2014). Nonverbal expressions of positive emotions. In M. N. Shiota, L. D. Kirby, & M. M. Tugade (Eds. ), Handbook of positive emotions (pp. 179-198). New York, NY: The Guilford Press. Schütte, S., Eklund, J., Ishihara, S., & Nagamachi, M. (2008). Affective meaning: The kansei engineering approach. In H. N. J. Schifferstein & P. Hekkert (Eds. ), Product experience (pp. 477-496). Amsterdam, the Netherlands: Elsevier. Smith, C. A., Tong, E. M. W., & Ellsworth, P. C. (2014). The differentiation of positive emotional experience as viewed through the lens of appraisal theory. In M. N. Shiota, L. D. Kirby, & M. M. Tugade (Eds. ), Handbook of positive emotions (pp. 11-27). New York, NY: The Guilford Press. Tong, E. M. W. (2014). Differentiation of 13 positive emotions by appraisals. Cognition & Emotion, 29(3), 484-503. Tractinsky, N., Katz, A., & Ikar, D. (2000). What is beautiful is usable. Interacting with Computers, 13(2), 127-145. Ulrich, K. T., & Eppinger, S. D. (1995). Product design and development (Vol. 384). New York, NY: McGraw-Hill. Visser, F. S. (2009). Bringing the everyday life of people into design. Delft, the Netherlands: Delft University of Technology. Worline, M., Wrzesniewski, A., & Rafaeli, A. (2002). Courage and work: Breaking routines to improve performance. In R. Lord & R. Klimoki (Eds. ), Emotions in the workplace: Understanding the structure and role of emotions in organizational behavior (pp. 295-330). Hoboken, NJ: John Wiley & Sons. Yoon, J., Desmet, P. M. A., & Pohlmeyer, A. E. (2013). Embodied typology of positive emotions: The development of a tool to facilitate emotional granularity in design. In Proceedings of the International Association of Sciences of Design Research (pp. 1195-1206). Tokyo, Japan. Yoon, J., Desmet, P. M. A., & van der Helm, A. (2012). Design for interest: Exploratory study on a distinct positive emotion in human-product interaction. International Journal of Design, 6(2), 67-80. Yoon, J., Pohlmeyer, A. E., & Desmet, P. M. A. (2014a). Nuances of emotions in product development: Seven key opportunities identified by design professionals. In Proceedings of the International Design Conference (pp. 643-652). Dubrovnik, Croatia. Yoon, J., Pohlmeyer, A. E., & Desmet, P. M. A. (2014b). The mood street: Designing for nuanced positive emotions. In Proceedings of the Nordic Conference on Human-Computer Interaction (pp. 707–716). New York, NY: ACM Press. Yu, Y., & Nam, T. (2014). Let’s giggle! : Design principles for humorous products. In Proceedings of the Conference on Designing Interactive Systems (pp. 275-284). New York, NY: ACM Press. Zhou, J., & George, J. M. (2003). Awakening employee creativity: The role of leader. Emotional Intelligence, 14(4-5), 545-568.